This is a beautiful and hard pass road that starts in the area of Sarnen. If you come down from Brünigpass (1008m) or from Glaubenbielen/Glaubenbüelen Pass (1565m), then you would start the climb in Sachslen (483m) and take the nice road via Flüeli. This road above Flüeli you have to guess on as I could not see any road signs, but it is fairly obvious which road to take to get into Melchtal. There are some possible short-cuts up from Sachslen (the shortest one noted in the map below), but the climb up here is decently steep even on the normal road and I do not know if the shortest road is fully asphalted. You can also start in Sarnen (475m) and climb via Flüeli (you will see a very big old hotel up there while climbing). 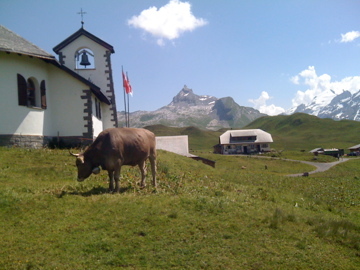 You could finally start in Kerns (564m) and also go via Flüeli. From above Flüeli to the main road in the Melchtal (after a little descent), it is almost flat. If you start from Kerns you can also take the more obvious road up the Melchtal. The climbing (apart from the Flüeli stretch) is very gentle until you come to the toll station at Stöckalp (1073m), where you could go up for free on a very narrow road during the times it is open in each direction. It was difficult with many cars when I was there and they really do not have much space to leave you on the side of the road and it is also very steep and you do not want to be out in the gravel. They are apparently not too happy with bicyclists here, but still have not forbidden cyclists outright like on one road in Austria (for example). The road is open the first 40 mins every even hour going up and every first 40 mins odd hours going down. It is not a very good idea to go down against the traffic (as I did) and you could possibly even be fined for it. A man there told me I was not allowed to go down, but I insisted as I could not wait another hour and I really was extremely careful and slow getting down, but even if I stopped for cars going up, then I got one or two a little scared by just seeing me on the road side and chances to have an accident is much bigger than you could imagine. At Melchsee-Frutt, you continue on the asphalted road up to Tannensee and could then descend to Tannalp (1974m) (restaurant) where the asphalt road ends. Other comments This pass is not marked as a pass on any map (that I know of), but this is a pass between Melchtal and Gental. From the end of the Tannensee (Fachshubel) there are at least two different passages down to Gental on paths. The pass is a little indistinct. It is really wonderful up at Tannen, so it is easy to understand why there are so many tourists up here on sunny days. However, I found that people up here were about as nice as downtown a big city during rush hours (from where they likely came), so the people (and cars on the access road) really makes the visit less fun.